The path to racing the Ironman Triathlon World Championship in Kona is an extremely difficult one: either you race at a nearly elite level to qualify (about 1720 athletes in 2010), or you face increasingly long odds of winning one of 200+ lottery slots each year. It goes almost without saying that, in general, the qualifiers will race Kona faster than the lottery winners. But here's something you might not have expected: if a lottery winner gets to the starting line in Kona, they are more than twice as likely to finish the race. 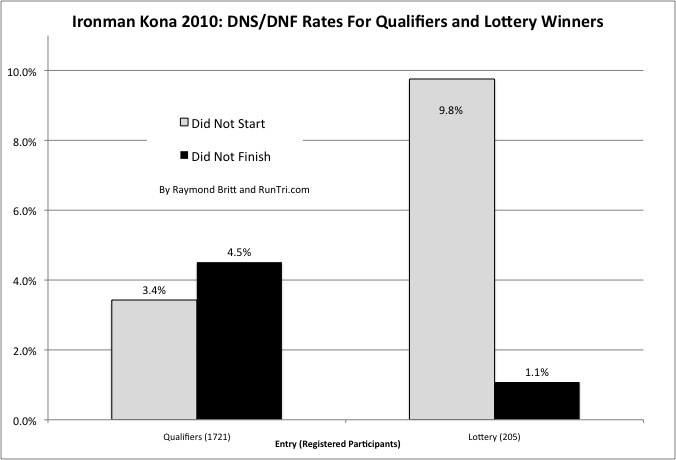 As shown by the black bars in the chart, DNF rate for qualifiers was 4.5% in 2010; DNF for lottery winners was less than 2%. However, part of the explanation is the dramatically higher rate of lottery winners who don't get to the starting line -- more than 9%. Naturally: only those lottery winners who are really ready to race take the long flight to Kona.